Person-centred care has become firmly embedded in care home settings, policies, and guidance over that last two decades. NICE guidelines promote integrated and person-centred approaches, inspection frameworks for older adults evaluate whether timely, appropriate person centred care has been delivered, and new social care legislation introduced in Wales puts the individual and their needs at the centre of their care – talking about ‘what matters to you’. 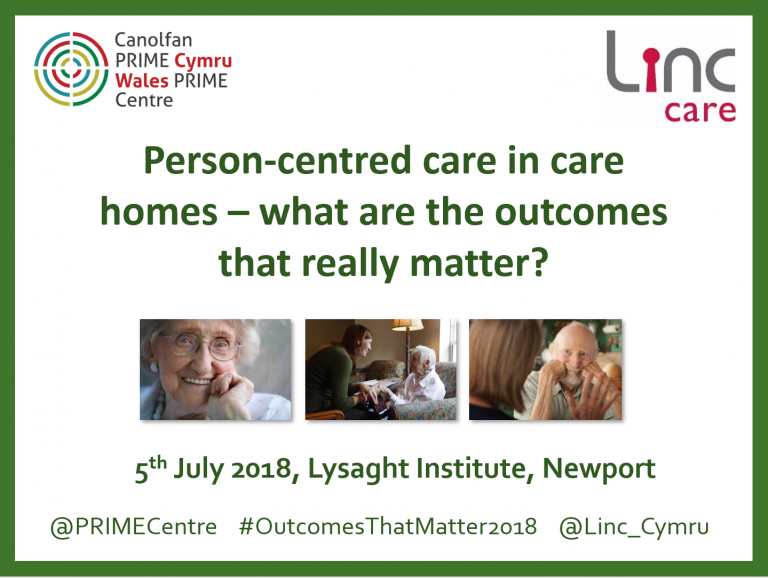 But there is ongoing uncertainty about what person-centred care actually is, and how those providing care in care homes can deliver and evidence person-centred care. Older people and care home staff themselves report that person-centred care is still not always being implemented. We conducted a study to identify the areas that are a priority for future research, and found that research into how person-centred care can best be delivered was the highest priority for care home staff. Following the study, a workshop was organised by the Centre for Trials Research and PRIME Centre Wales to bring together experts in Wales with an interest in care for the older person, to begin to develop research ideas collaboratively. Following on from the event, we formed a collaboration with Anne Thomas (Executive Director, Linc Care) to explore these questions further. 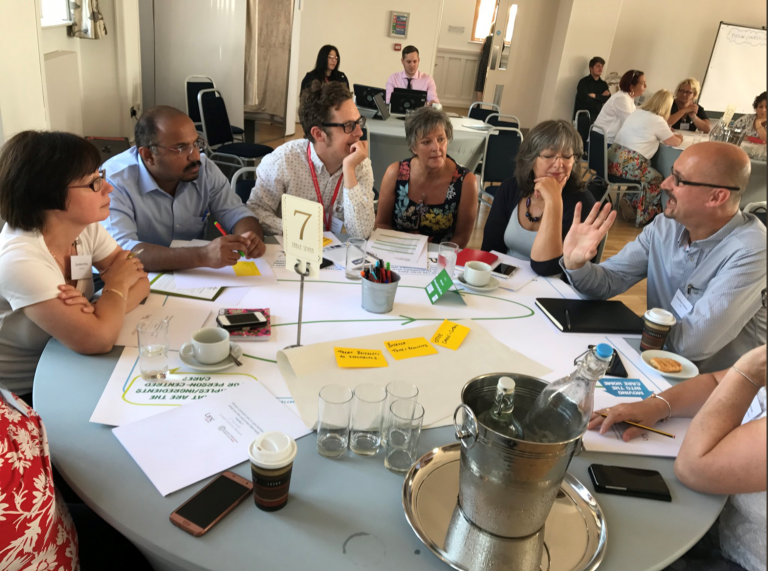 The first step was to organise an event to bring together a broad range of stakeholders to explore: what person-centred care looks like in practice, what the outcomes are that really matter to those receiving care, and what is in the way of achieving person-centred care. We were delighted to welcome a large number of representatives from health boards, third sector organisations, care regulators, commissioners, researchers, care providers, and users of services (older person or a family member/supporter) to a very sunny Lysaght Institute in Newport. 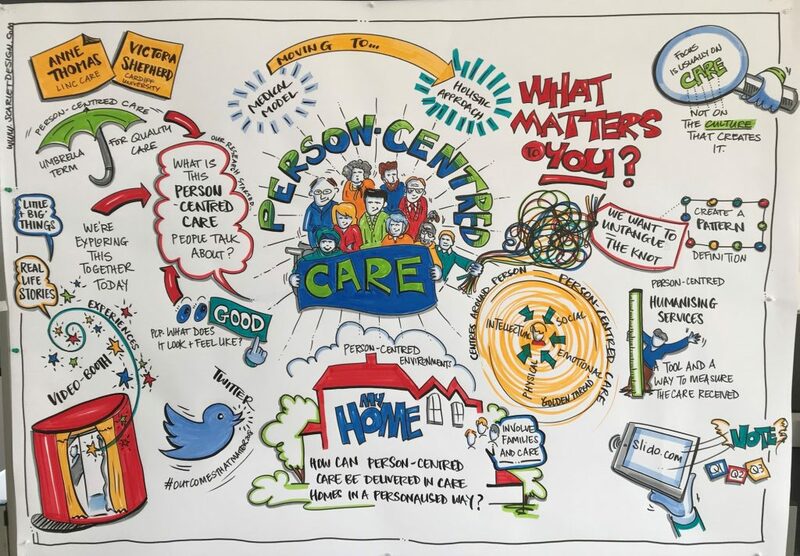 We encouraged delegates to share their experiences of care in care homes, hear about others’ experiences, and help generate consensus about what person-centred care actually is, and how we can provide the care that really matters to those who receive it. During the day we used a number of interactive communication activities as a way of using creative approaches to explore a much talked about concept, including: visual maps, video booths to capture real-life stories, visual facilitation, and online audience interaction to gain consensus around important issues. Our interactive word cloud showed the importance to delegates of choice, dignity and respect when thinking about person-centred care in care homes. Other key messages that emerged from the day were: the importance of ‘knowing’ and building relationships which was described as a golden thread running through all elements of care; creating a culture of care and empowering carers to be able to provide person-centred care; and the need for asset-based approaches – attending to people’s strengths and not just their needs. The topic of how to recognise and evidence person-centred care generated a great deal of discussion. It was very interesting to see how, despite a great deal of focus being on the importance of documentation in this sector, delegates thought that ‘how it feels’ and ‘what we see’ were more important indicators than documentation which tends to focus on needs and whether these have been met. Alternative formats for capturing these more elusive concepts are needed in order to more fully evidence that person-centred care has been delivered. 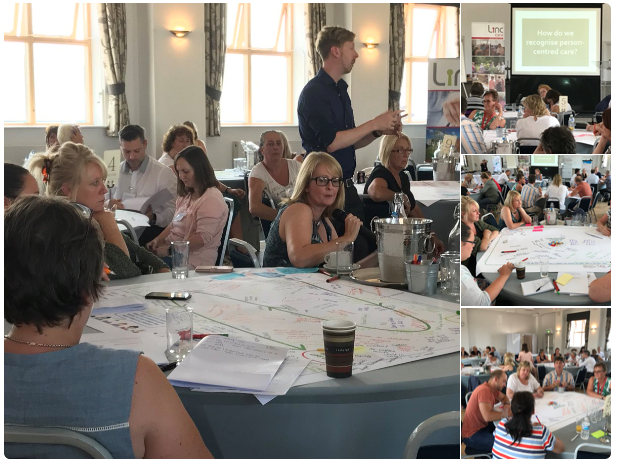 Our next steps are to summarise the rich discussions, illustrations, and ideas generated during the day, and use these as a next step towards ‘untangling the knot’ of person-centred care. We look forward to reporting more about this work in the future.